One year ago, Dwayne Johnson returned to the WWE and once again began referring to himself as The Rock. He claimed he was back for good. 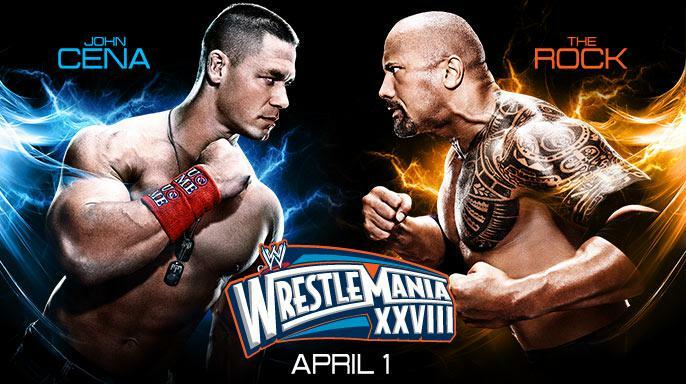 He even set up a match against 12-time WWE Champion John Cena for WrestleMania 28, this year. However, shortly after Dwayne claimed to be back, he left, again. Over the course of the last year, he has made a handful of appearances, mostly via satellite. He was convinced to appear in a tag team match at the Survivor Series pay-per-view. Since then, no Rocky. For months, Cena and Dwayne have gone back and forth on Twitter and through social media. As Cena has knocked Dwayne about claiming to be back, but not showing up to any events, leaving 9 years ago and asking to not be called The Rock, ignoring any questions about his wrestling career, and about being self-centered as Dwayne is getting a big paycheck for doing very little. Numerous reports have come out that Dwayne, who is one of the legends of WWE, who could actually contribute to the company by promoting it, hyping up other stars, or at the very least speaking to the other wrestlers in the back, has done none of it. He reportedly enters the building, walks to the ring, cuts his promo, and leaves, not even acknowledging others, much less stopping to give tips to the younger athletes. Last night marked the night that Dwayne was finally supposed to come back and respond to Cena. Dwayne spent 15 minutes drinking water, trying to get random words to trend on Twitter, and essentially not addressing any of the critiques Cena has made. Dwayne would mention something Cena said, then make an argument that sums up to, “nu-uh” and proceed to make random cheap pops at Cena that made it look like Dwayne was living up to a sponsor deal by mentioning specific foods and the local basketball team. That’s when Dwayne’s world came crashing down. Cena came out and in two minutes knocked down Dwayne’s credibility. Cena acknowledged that he wasn’t there to win the fans; he understood the psychology of it. Cena continued to break down Dwayne’s childish, unintelligent rant and called him out on his self-centeredness and how much Dwayne is really here for a paycheck, not for the WWE. Cena then hit Dwayne with a crucial blow in the form of pointing out that Dwayne, who praises himself as a great promo man, had promo notes written on his wrist, making it ever more obvious that “The Rock” was phoning it in and not even slightly trying for the fans after being gone for months. After Cena left the ring, Dwayne waited nearly a minute for Cena to make his exit before talking about how lucky Cena was to leave before he had his chance to hit him. Apparently it takes Dwayne over 60 seconds to land a punch. The fans continue to love Dwayne for the same reason they would love Michael Jordan if he suited up tomorrow, it reminds them of what made them fans years ago. But for the last year, any objectable viewer can tell that while Cena has proven why he’s a star and the best, Dwayne has disrespected the fans and simply has been collecting a paycheck.